Liposuction is a contouring procedure which removes unwanted excess fat from specific areas of the body, especially the abdomen, buttocks, hips, thighs, knees and upper arms. Liposuction is not a weight loss method but rather a body contouring technique. It is a safe, effective way to achieve a sleeker shape that is in greater harmony with the rest of your body. Liposuction is one of the most commonly performed cosmetic procedures at Morea Plastic Surgery Center of North Raleigh. Although there are several different methods of liposuction, Dr. Morea prefers the tumescent technique for more precise and dramatic results. All liposuction procedures are performed in our fully accredited AAAASF certified operating suite using either heavy IV sedation or general anesthesia. Dr. Morea will begin making small incisions and injecting the fat with an anesthetic solution which improves comfort and minimizes bleeding. A specialized hollow tube called a cannula is inserted to break up and suction out the excess fat. Immediately following your liposuction, you will be placed in a compression garment to control swelling, minimize bruising and provide additional comfort. You will be advised to wear this garment for several weeks following liposuction in order to achieve optimal results. Our patients see a noticeable difference in the shape of their body within one to two weeks after surgery. Once fat cells are removed, they should not return, but it is important to note that liposuction does not remove all of the fat cells in any given area. A large weight gain after liposuction can affect the results of your liposuction. Maintaining a healthy weight and exercising will provide long lasting results from your liposuction surgery. During your first consultation at Morea Plastic Surgery in Raleigh, N.C., you will meet personally with Dr. Morea to discuss your liposuction areas of concern. He will examine you and help you determine which liposuction procedure is best for you. 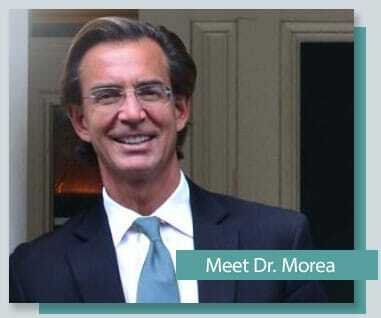 Dr. Morea will give you a person tour of his North Raleigh plastic surgery center. At the end of your consultation, you will be given a quote for the exact cost of the liposuction procedure designed for you.